An ancient Wonder of the World, Machu Picchu has been on my bucket list since I can remember. I was determined to see it some day. I decided to finally book my ticket to Peru earlier this summer. I had been back home in Dallas for a couple of months and I was ready to leave and explore some place new. We flew from Fort Lauderdale to Lima, Peru. Our flight arrived around midnight. A visa is not required for American citizens to enter Peru, but proof of an exit ticket was a requirement when we were boarding the plane. We were going to Peru without a set timeframe to return. We knew we were going to stay in the country for close to 2 months or longer so in order to get away with not buying a return plane ticket, we bought a bus ticket to Bolivia. It was an easy way to show proof of leaving Peru, but not necessarily purchasing an expensive plane ticket back to the States before we were ready. It was October when we arrived at the Lima airport. The wait time to get through Immigration was short. There was no proof of exit required when we were questioned by the Immigration officer. All they asked was how long were we planning to stay in the country. American citizens may be granted up to 180 days stay so we decided on staying for up to 60 days. American Citizens may be granted up to 180 days stay in Peru. Once outside customs, we needed to find transportation to the hotel. There were more than plenty of taxi drivers waiting outside the doors. We were bombarded with offers from drivers asking where we were going and how much we were willing to pay. The next morning we were moving accommodations to an airbnb room we reserved that was closer to Miraflores area. This is basically the very touristy part of town. We wanted to be in walking distance of the center. Unfortunately, we ended up there on their National Census Day. Meaning all the businesses were closed for the day, everyone was ordered to be home all day so that the Census could be completed. It meant taxis, buses, stores, restaurants, everything was to be shut down until later in the evening. Once we checked into the airbnb we set off to explore on foot. Our host was very helpful and informative. Lima was like a ghost town on National Census Day. He showed us around the area, which was just steps away from the Boardwalk overlooking the beach. The boardwalk led to a large park with running trails, tennis and soccer courts, and landscaped representations of the Nazca Lines. Then we walked to the main center of Miraflores where all of the restaurants and stores catering to tourists are located. It was a bit bizarre since everything was closed and the streets were empty. We were starving! It had been all morning that we had not eaten anything except for a couple of leftover snacks from the flight. With nothing else to do we kept walking in search of a place to hangout for a few hours until places started to open later in the evening. We walked to the central park aka Kennedy Park, sat and people watched for a couple of hours. Nav, my travel buddy, fell in love with this park because there were all kinds of cats that lived in there. They are up for adoption but until they are found a home, they are well kept in the park area, free to roam around as they please. The park is beautifully manicured with flower gardens and many places for the kitties to live. It was cat heaven! Lima reminded me of any medium sized city. There were plenty of chain restaurants and stores in the area. It was a busy city. Most signs are in spanish, heavy traffic, some parts of the city were a bit sketchy, some a lot nicer and well kept. The beach was gloomy and cloudy. It was certainly not a pretty sunny white sandy beach like you might think. Next, from Lima we took a very long 22 hour overnight bus ride to Cusco. It actually was not as bad as we had anticipated. The seats were comfy enough and we were given a couple meals. Once in Cusco, we took a taxi to the airbnb we booked that is south of the city. I rather liked the location since we were 20 minutes walking distance from the main square, there were no tourists in the area. It was quiet except for when the neighbors had parties on Sunday nights and blasted dance music for hours. We visited some of the towns nearby on a few day trips. Ollantaytambo which has ruins, is the main stop for those going to Machu Picchu by train. The other cities we visited were Urubamba and Pisac. It was pretty easy getting to those towns by colectivo. You walk to Pavitos Street and all along there you will find plenty of small vans going to any of those towns. You do have to wait for the van to fill up with enough passengers before departing though. One time we waited almost an hour before we left, but it is very economical. Cost us less than $3 USD one way. The highlight of the trip was to be our 28 mile (45 km), 4 day hike to Machu Picchu. Unfortunately, I was unable to finish the trek due to an injury. The beginning of the hike was nice and beautiful. The food served to us by the crew was exceptional! Who would have expected the meals to be prepared so exquisitely in the middle of a mountain trek?! We were served pancakes and quinoa porriage for breakfast. For lunch, we were served pumpkin soup, ceviche, grilled trout with veggies, avocado salad, and choclo (corn) with cheese. Since we did not finish the hike on foot, we took the train to the town of Aguas Calientes. It is a city designed essentially as base camp for all those going to M.P. Intrepid Travel offers tour packages for the Inca Trail and many other tours. 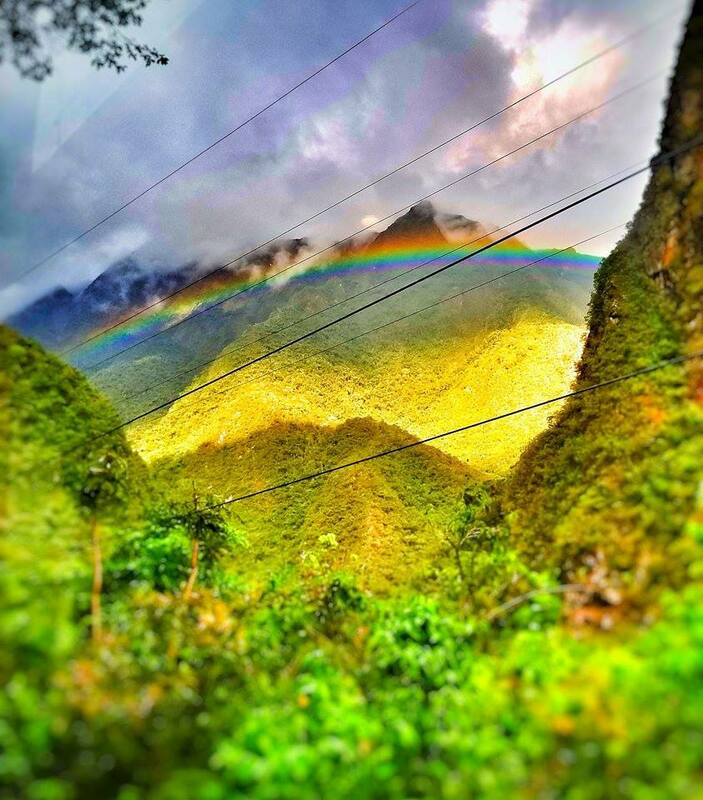 The train ride on Peru Rail was gorgeous, we got lucky and found promo tickets on their panoramic train called Vistadome. We were served complimentary coffee/tea/juice and cake on the two hour ride. Once in Aguas Calientes we checked into our hostel and rested for the night. First thing in the morning we got ready to meet up with the rest of our trekking group at the entrance to Machu Picchu. The massive ancient Incan city was magnificent! We took the shuttle up the mountain to the entrance. It was rainy and the cloudy mist made the mountain look mystical. Once at the entrance we entered with our guides and he showed us around the ancient site. He explained the symbolism and advanced architecture of the buildings. The guide told us about the construction technique of the walls, purposely leaning several degrees into one another, was meant to prevent collapse when earthquakes struck. The ancient ruins were magnificent! Everything I had envisioned and more. The cloudy weather made getting selfies a bit difficult, but it was still breathtaking looking out at the massive Incan city. The mountains surrounding the city looked lusciously green and untouched. We even spotted a couple of llamas grazing around the top of the ruins. The next month spent in Peru was our volunteer time working at a hostel in Cusco in exchange for free accommodation with breakfast. It was easy work. We mainly handled reception and a bit of housekeeping on particularly busy days. After spending two months in Peru, I have learned a great deal about how Peruvian culture resembles latin culture in Central America and Mexico. Besides, the obvious similar language that is spoken throughout those regions, the people are warm and welcoming. I also get a sense of a strong work ethic that is well known among our latin culture. The host of our airbnb in Lima was extremely helpful and friendly. The first day of our arrival, he came out to meet us and set us up with a taxi to take us to the house. He was very accommodating. Once we were settled in the house, he showed us around the town and gave us a lot of information about how to get around the city. He said he wanted us to have the best experience possible while staying there and would be willing to answer any questions he could about the city or anything else we needed. Everyday he would check in with us to be sure we were doing alright. He even provided maps and other helpful guides for us. He really went above and beyond as an airbnb host. While staying at an airbnb in Cusco, we met a lovely and kind Peruvian lady named Ms. Amapola. She took care of the cleaning and other needs of the house for the owner. She was always very attentive and friendly. Anytime we ran into her in the hallway she would ask us how our stay was going and if we needed anything at all. She lived on the 2nd floor of the building so she would tell us to just knock if we had any issues. One day she asked us if we would be ok with her son filling in for her for a few days. Ms. Amapola said her mother had just passed away and was flying out to her hometown for the funeral. I wanted to give her a big hug and tell her how sorry I felt for her loss. I let her know that, of course, we wouldn’t mind that she had to leave. What a very tragic time for her. I really can’t imagine what she must have been going through. I wish her and her family my best regards. In the smaller towns outside of Cusco we met some very kind people, also. We were in the town of Urubamba and walking to the Salineras Marinas aka Salt Mines. It was a long three hour walk and very hot out. 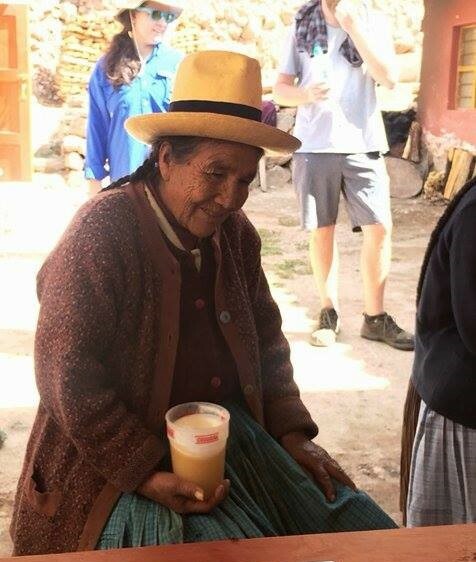 Along the way, we stopped to rest and try the local drink “chicha” aka corn beer. It is homebrewed and fermented by the locals. When walking the through the town, you can see certain houses have the signature red bag on the end of poll hanging from the roof. That signals that chicha is brewed and sold there. The ladies we met at one of the farm houses did not speak much Spanish. They spoke the local Quechua language so we did not communicate much verbally, but they were still kind and sweet. They offered us a glass and asked us to sit and drink with them. By far, the kindest and most helpful Peruvian I met was Hans, one of the tour guides on our hike to Machu Picchu. We were hiking on the Inca Trail for 4 days and on Day 2 my oldleg injury really started acting up. The trek was not easy and the second day involved many many many uneven stone stairs. My leg locked up and I was hurting badly. I tried my hardest to keep going despite the pain, but all the stairs were slowing me down even more. 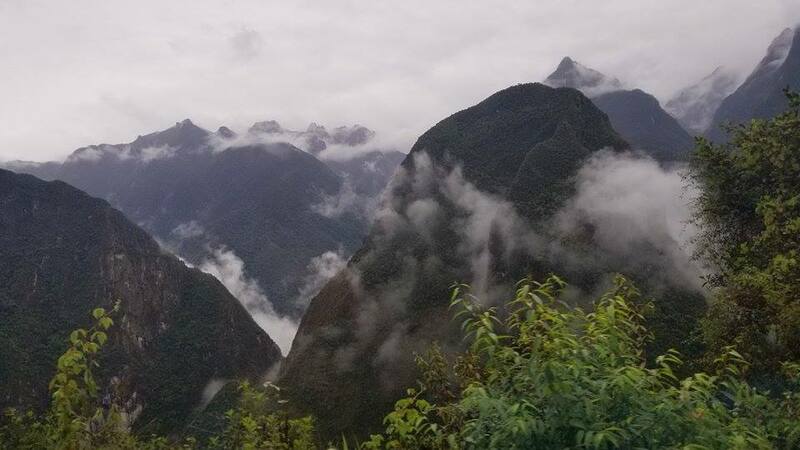 Our tour guide suggested I turn back and not continue to the hardest part of the entire trek, Dead Woman’s Pass which was incredibly steep with hundreds of stairs. My partner and I were sent back to hike the return trail that led to the entrance. Hans was sent with us as our guide while the rest of the group continued on with the hike. It tooks us another few hours to get back down to the campsite. So that meant it had been 12 hours that I had been walking up and down on an injured leg and I was absolutely spent. I was literally in tears from the pain but Hans was so helpful. He helped carry my backpack part of the way back while encouraging me to try and keep moving. And when I collapsed from the agony of my leg, he put me on his back and carried me to the site where we were camping for the night. There’s no way I would have been able to make it without him. I can’t thank him enough. There are hardworking men and women in the farms and all over the towns making a living anyway they can. Some women selling their souvenirs on the street will take a local collectivo bus all the way from the small outer lying villages, ride for over an hour everyday, to Cusco just to sell their goods. They carry their merchandise by wrapping it up in a colorful cloth and tying it around their chest like a backpack. It must be exhausting considering they leave their home town at daybreak and don't leave to go home again until the sun goes down. Much respect. Locals say that the weather changes “like a woman changes her mind”. One day it will be hot and sunny, then later cold and windy in the evening. One day in Cusco, there was a sudden hail storm out of nowhere. There were tiny pellets falling leaving the ground completely white. My favorite village in Peru, so far, has been Pisac. It’s about 45 minutes outside of Cusco and it’s small but quaint. Best known for the ancient ruins on the northern part of town. I really enjoyed the large street market they hold every Sunday. They sell food, fruit, veggies, clothes, jewelry, and all kinds of handmade local souvenirs. I wouldn’t mind going back there again to explore more of the small city. Overall Peru has been a great experience. 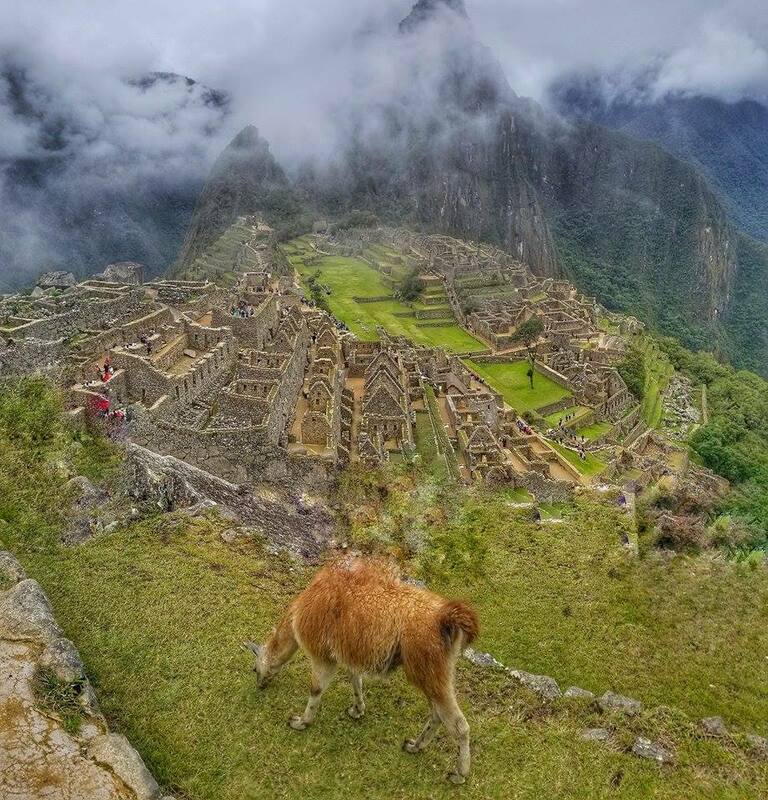 Machu Picchu is a must see! I wasn’t sure how I would feel about spending such a long time in one country but I’m glad I was able to really get to know the area and the people. Follow my IG feed @rgreatescape to see more travel pics.